Here in Southern California, we are blessed with an evergrowing number of vegan and vegan-friendly businesses. It seems almost every month there is word of a new veg restaurant, or special menu, or food truck opening up somewhere in our area. Having previously lived in cities with less-than-stellar numbers of plant-based places, I do realize how fortunate we are in San Diego. Thus, I thought I would share my favorite vegan spots today. Whether you live here or are planning a visit, are a veg head or are not, like food or are head over heels for it, you need to check out these places ASAP. Don Carlos is walking distance from Matt and me, so we end up here more often than we probably should. It also is not vegan, but they have plenty of options. Our go-to order is the veggie burrito with black beans, no cheese, add fries. Mmmmmmmm. This Mexican restaurant is not vegan, but the amount of plant-based options on their (seriously extensive) menu is borderline overwhelming. It's SO delicious, though, and the price is right. This is a chain, but their chicken and waffles is MY ALL-TIME FAVORITE. If I could physically live on one food item for the rest of my days, this dish would be it. Plus, the rest of their food is (almost as) amazing, too. If you ever visit a city that has a Native Foods, SPRINT to the nearest one. After months of hearing about it nonstop, I finally tried Donna Jean for the first time ever a few weeks ago. They're famous for their mac and cheese - and for good reason. It is the closest to "real" macaroni and cheese I've ever eaten. SO TASTY. Get yourself to this San Diego plant-based staple as soon as you possibly can. 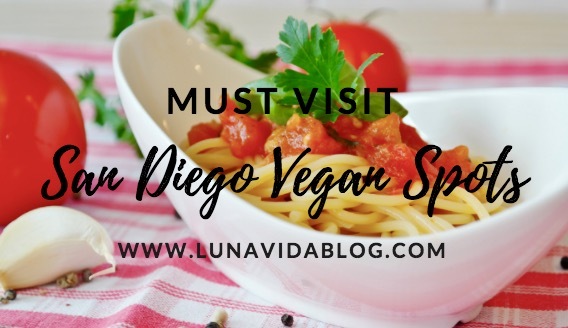 San Diego County has so many more delicious vegan places, but these are just some of my personal favorites. This list is just the beginning - I still have so many to try, too! What's your favorite plant-based place? Anywhere in San Diego I need to try, like, yesterday? Now I'm off to gorge myself after all this food talk. I want to go try some of these! Always looking for tickets. These all sound so good! I'll have to check them out next time I'm in SD!